Reenacting is an enjoyable and educational hobby that allows a person to closely experience the life and times of a Civil War era soldier or civilian. Authenticity is highly stressed, except that today health and safety are not compromised. The “Unit” provides guidance and is the basic hobby structure. Members generally provide all their own equipment and clothing. These items are readily available for purchase by mail order or from vendors at events. Events are held three seasons out of the year in this region of the country, with several within two hours drive of the Fredericksburg area. Events are by invitation to the Unit. Members vote on the events we attend. 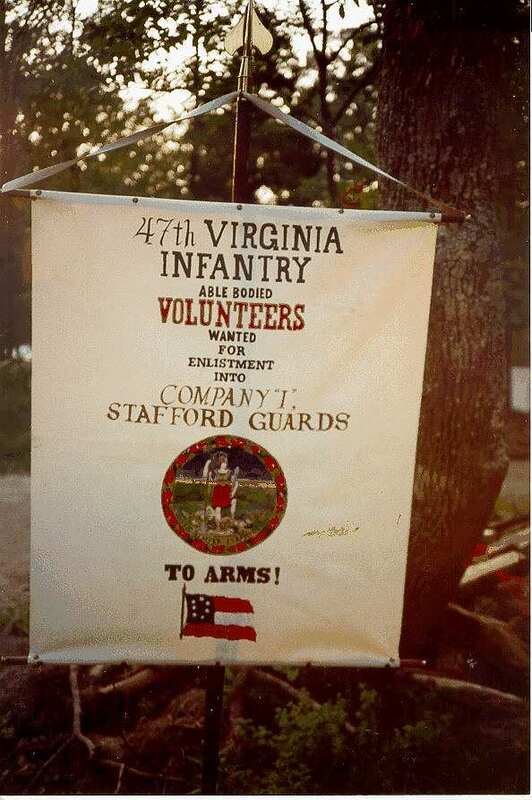 The 47th Virginia was established in 1981, by experienced reenactors. We are members of Longstreet’s Corps. Our Unit sets high standards for authenticity and trains to be the best Unit in the Corps. We are membership driven and family oriented. Safety, in camp and on the field, is paramount in our training. Unit dues are minimal and include liability insurance. Participation is strictly optional for any activity or event. New members receive the 47th’s “New Recruit Guide”, which details uniform and accouterments requirements as well as, language of the 19th century and other information helpful to the new reenactor. All members and recruits are kept informed of Unit activities through our newsletter. We treat new members like family, with guidance and friendship. The Unit holds monthly meetings for members and plans other events including family picnics, holiday parties, National Park Service assistance and historical sightseeing. “The Stafford Guard”, was raised in Stafford County in April, 1861, and assigned to man artillery batteries at Aquia Landing, along the Potomac River. Combat came quickly with engagements against Union gunboats on May 31 and June 1. 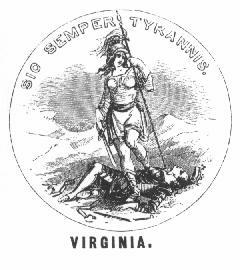 After being assigned to the Commonwealth and designated The 47th Virginia Infantry, Co. I, the Stafford Guard moved to the Peninsula Campaign as part of General A. P. Hill’s legendary “Light Division”. Later, in Hill’s Third Corps, the 47th fought on Prospect Hill (Battle of Fredericksburg), Chancellorsville, Gettysburg (first day action as well as on the extreme left of Pickett’s Charge). Decimated by these and the campaigns of 1864, what remained of the 47th was captured at Sayler’s Creek in April of 1865. Q. I have a busy schedule, how much time is required? A. Our unit is flexible. You may choose to attend one event or all, at your discretion. This concern is common among New Recruits. Most reenactors find the time because events are so much fun! Remember this is a hobby! You are required, however, to attend three (3) events during the calendar year in order to maintain voting status. Q. What physical condition do I need to be in to portray an soldier in the Confederate infantry? A. With many events held in the hot summer months, some including long overland marches, potential recruits must consider their physical abilities in choosing their impression. However, by following some common sense rules, most people in average condition can participate in events. This does not prevent others from joining the Unit and developing their own civilian impression. Participants who wear glasses must use 1860’s period frames. These may be obtained from sutlers. Q. How expensive is this Hobby? A. Although the expense can be substantial, the expense may be made over a period of time, concentrating on the fundamental equipment first. The Unit maintains a “New Recruit Box” which contains some items. You will want to acquire your own equipment as soon as practicable as the “Box” is generally for walk-ons and first timers. Initial equipment may exceed $1,000. Half of this amount will be for a musket. Prudent shopping and some sewing can also reduce the initial expense. The 47th provides recruits with access to an online Forum (click here) where they can post questions related to uniforms and equipment to be answered by our members. The Forum also contains a list of suggested vendors for various clothing and equipment. We encourage you to choose carefully and ask lots of questions. Q. How important is it to live in the Fredericksburg area, where the Unit is based? A. Not at all. Our membership currently spans from Northern Virginia to Newport News. We also have several members from out of state. Most of our events are within Virginia and surrounding states. We will gladly refer you to another unit if we feel you are outside our region. Membership is open to anyone. We do require that historical impressions conform to the military and social standards of the 1860s, in the South. Prospective members must attend three (3) events to be eligible for full membership in the Unit. Spouses and children under 16 that participate in events are considered members. Youths in ages from 16 to 17 may be voted in as members and must be accompanied by a parent or guardian at events. Click Here to see our handout about the drill we use. Also, if you are interested in a more comprehensive version of our drill, try the link off of our homepage to Gilham's Manual.